My drier has developed an awful squeak. It’s happened before, and my husband can fix it, but it’s not a high priority on his list of repairs, so I hang my clothes outside. I’ve threatened to get my own tool box. My clothespin bag hangs on a hook on the back porch. It’s convenient to the washer and to the steps leading out to the yard and the clothesline. Two weeks ago, I grabbed the clothespin bag and threw it into the basket of wet laundry. I noticed a small clump of dried mud as it fell from the inside of the bag onto my clean blouse. 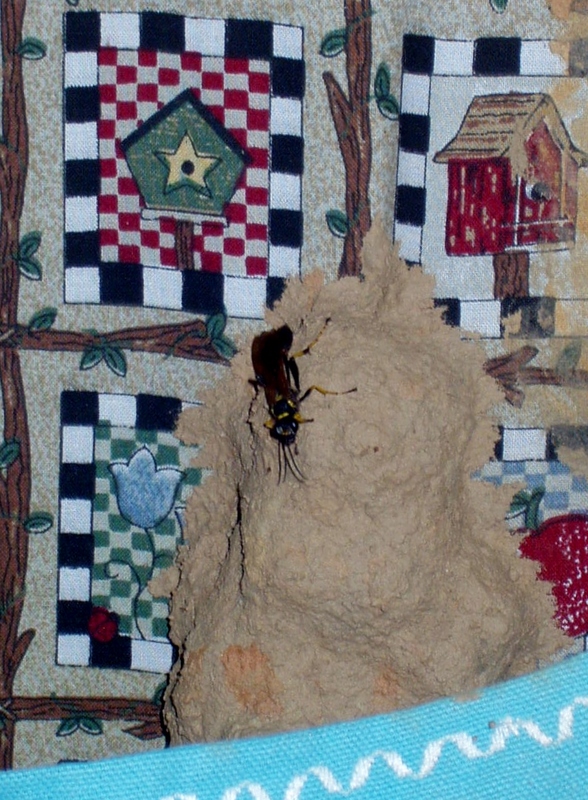 A mud dauber’s nest. I threw my now dirty blouse back into the washer and stomped out the door to the clothesline, throwing the infamous clump of mud into the yard. After hanging the rest of my clean clothes, I returned to the porch, hung my clothespin bag back on its hook and turned to work on the rest of the laundry. That’s when I noticed her, the mud dauber, a thin, black and yellow wasp-like insect. She flew back and forth across the front of the clothespin bag. She didn’t land on it, just passed in front of it over and over again. Oh no, I thought. She’s searching for her nest. My conscience got the better of me. I hurried back out to the yard in search of the clump of dried mud I’d thrown. It took me the better part of fifteen minutes to find it. I picked it up and examined it for cracks. It was intact, including a small round hole near the bottom. I hoped no eggs had rolled out when my anger got the better of me. I marched myself back to the clothespin bag where I examined the damage I’d caused. The nest had been attached fairly high up in the bag. I wondered what might happen if I propped the nest close to where it had been. Maybe the mud dauber would come back to it and repair my insult, re-attach her creation. Of course, I’d used some of the clothes pins for the wash, so I needed to build up the mound in order to put “operation rebuild” back into place. Meanwhile, Ms. Mud Dauber kept her vigil of hovering, turning every once in a while to look at me, accusingly. I ran to the stash and opened the new bag. Piling the pins as close to the original placement of the nest as I could, I gingerly placed the bottom of the mud nest into the clothespins and propped its top against the back fabric of the bag. She landed on the opening to the bag and surveyed the damage. I could imagine her shaking her tiny head as I went back into the house, closing the backdoor behind me. I check on Muddy often now. We’re on a first name basis. My family members smirk as they ask me how my new friend is doing. I frown at them. They don’t understand my connection with Muddy. The two of us meet on the back porch at least once a day. She works hard daubing new little round patches on the covering of her legacy, and she listens as I tell her my frustrations about my own nest building. She thinks it’s a good idea for me to get my own set of tools. Women are capable. I wave as Muddy slips through the crack around the storm door frame, heading to the yard for more mud, or to capture a spider to feed her babies. “That door needs fixing,” I say, as I watch Muddy’s slim body hover for a second in the sunshine. “Really?” she asks, then she flies off on her errand.